Keith Miller made a great impression on the British public whilst playing for the Australian Services XI in 1945. It was an austere time, and the end of the war did very little to end the shortages of most consumer goods. There was little luxury for anyone, but Miller’s extravagant strokeplay and blistering fast bowling weren’t on the ration, and with his charming personality and matinee idol looks he became a star. The final leg of the Services XI tour took them round Australia and it was not until the end of January 1946 that the touring party finally broke up. Miller soon found himself, at the relatively advanced age of 26, unemployed and newly married. He did not then have the same high profile at home that he had in England, and the game in Australia being essentially amateur his future looked uncertain. The Services XI had whetted English appetites, and the Leagues in Lancashire in particular were looking very hard at Australia in their search for talent, and those who ran Lancashire League club Rawtenstall wanted Miller. They offered him a three year deal, on £1,000 a season, and conservatively estimated that with endorsements and the other work that his contract would permit he could triple that figure. That would give him the equivalent of £110,000 today. It was an offer Miller could not refuse, and he didn’t. The signing of the Rawtenstall contract meant that Miller was giving up his Test career hence, no doubt, the value of the contract. But then the 1946/47 Ashes series took place. Australia won the series, and Miller averaged 76.80 with the bat, and 20.87 with the ball, and suddenly he was as big a draw in Australia as in England. Now there were job offers aplenty, and a long Test career beckoned. The attraction of the sometimes cold and dreary conditions of the Lancashire League began to pale and, in the end, Miller reneged on the contract and told Rawtenstall he wasn’t coming. The club were furious, and went to great lengths to ensure that Miller received a life ban from playing in the League. They still hadn’t calmed down when Miller the Invincible arrived in England in 1948 and pursued him with threats of legal action, so much so that eventually a compromise was reached and Miller agreed to pay £50 in damages for breach of contract. So what exactly was the damage that Rawtenstall suffered? They didn’t have to pay anything to Miller and they managed to find a replacement for him. Ken Grieves might not have brought so many through the turnstiles, but he would have cost the club very much less. I suppose it is just about possible that the club had entered into binding committments on the back of signing Miller, but that does not seem to have been the case from the sources I have consulted. Given that in 1947 Grieves ended up with 907 runs at 45.35 and 89 wickets at 10.29, and thanks to that Rawtenstall came close to winning their first League title since 1926 as they finished as runners-up to East Lancashire, they certainly could not claim that they had a less effective pro. There have been many thousands of words written about Keith Miller since 1947, and I have written a few of them myself, so I will leave him back in Australia, 10,000 miles away from those in Northern England who were vexed with him. I turn then to Ken Grieves, about whom very few words have been written, but he is an interesting character nonetheless,who is likely to hold one record in perpetuity. No Australian can get close to his tally of 610 catches in First Class cricket – Mark Waugh and Albert Trott are a distant second on 452. Grieves was born in Sydney in 1925, to a father who had no enthusiasm for sport, and his four brothers were similarly disinterested. But thankfully for him when he was 11 he was sufficiently enthused by the lure of going to the SCG to see the first day of the second Test of the 1936/37 Ashes series to bunk off school in order to attend. England had a good day, and the young Grieves was entranced by their master batsman, Wally Hammond, who ended the day on 167 not out. When he got home he dashed into his house and the first thing he did was tell his mother about Hammond and add I want to be a cricketer like him if I can. The young enthusiast’s first tentative steps were taken playing for All Saints, Petersham in the New South Wales Churches Union from where he eventually attracted the attention of the famous Petersham club, who numbered amidst their recent alumni men like Sid Barnes, Cec Pepper, Bill Alley and Ernie Toshack. At 16 Grieves spent just one season working his way through the club’s five sides and reaching a First Grade debut against Gordon. He made 20 in 15 minutes before getting out to, in his words, the worst stroke in the calendar – a wild sweep to a ball well pitched up on the middle stump. He was in trouble with his Petersham coach and later national selector Dudley Seddon, but opposing pace bowler ‘Ginty’ Lush was sufficiently impressed to predict in his newspaper column a bright future for this lad Grieves. When the war broke out Grieves was working as a sound mechanic on PA systems for use by the Navy and Air Force, and by the time peace came the 20 year old had done enough on the cricket field to be selected for the New South Wales side for their second First Class match of the season. Grieves scored 68 in an innings victory and there was further success in that truncated season, and he finished fifth in the national averages. He scored 275 runs at 55.00. Essentially a batsman at this stage there were just two wickets. The highlight of the season was his appearance against the Australian Services XI. By the time the Services side got to the SCG they were winding down after a long tour. They had begun with the Victory Tests in England followed by a trip to the sub-continent, before finishing up with a game against each of the home states. The tourists were no doubt weary by January 1946 when they played New South Wales, but they were still a fine side. Miller never forgot meeting Grieves in that match as he was greeted with a flashing square cut off a ball only just short of a length that rapped the pickets before a fielder could move. Grieves’ ended his innings with an unbeaten 102 as his side secured an innings victory. After that start Grieves must have been disappointed with his performances the following season. He played just four times, and scored only 55 runs all told and did not take a wicket. A keen soccer and baseball player as well as cricketer Grieves was offered the opportunity to fill the place left vacant by teammate Miller. Most accounts suggest that the introduction of Grieves to the Lancashire League outfit was an attempt by Miller to placate the unhappy Lancastrians. If it was, as he found out in 1948, it did not entirely wipe the slate clean as far as Rawtenstall were concerned. In any event Grieves flew out to England, arriving in the damp mill town on 1st April 1947. The man who delighted the Rawtenstall public through 1947 was a batsman who was far from orthodox and not a source of great pleasure for the purists, but he was mightily effective. He batted right handed and had a low crouching stance. His feet were some way apart and, unsurprisingly with that approach was, as Miller found out so quickly, particularly strong square of the wicket. With the ball Grieves was a purveyor of right arm wrist spin. He was not a big spinner of the ball but had a googly and a top spinner in his armoury as well as his stock leg break. In the field Grieves used agility and anticipation to be a feared man whilst fielding close in, whether in the leg traps that off spinners were permitted in the early part of his career, or at slip. He was a tall man, slightly over six feet in height, not usually something which assists close catchers, but to more than offset that Grieves was able to look to the skills that he utilised for his winter work on the football field, between the posts. At the end of the 1947 summer Grieves had a trial with Manchester United. The Red Devils didn’t have the pedigree then that they have now, but Matt Busby had just been appointed, and the club had finished as runners-up in the old First Division in 1946/47, just a point behind champions Liverpool. In his own words Grieves put on a shocking display. It was fortunate therefore that he had another trial arranged for that afternoon. He did rather better in front of the coaching staff at Gigg Lane, and he was offered a contract by Second Division Bury. He played 21 league games in 1947/48, a season in which “The Shakers” flirted with relegation before ending the campaign just clear of the drop, in 20th place out of 22. It was doubtless a case of deja vue for Grieves in 1948 as, similarly to his second season with NSW, he went backwards with Rawtenstall, so much so that by the middle of the season he was looking into a return passage to Australia, no offer of a new contract from the club being forthcoming. In the end the club signed the Indian Test batsman Vijay Hazare in place of Grieves, and he moved into the First Class game. His qualifying period having been served he received an offer from Lancashire that he was delighted to accept. For the third time Grieves’ first season at a new level was a success. He scored in excess of 1,400 runs for Lancashire and took more than 60 wickets to amply justify the club’s move for him. Unlike previous experiences however his second season was also a positive experience. His totals of runs and wickets were all but the same as the previous season. The downside was that his batting average dropped from 38.02 to 31.62, but that had to be set against a similar drop in his bowling average, from 27.06 to 21.67. Both statistics were a reflection of the vagaries of weather and wickets rather than any deterioration or improvement in Grieves’ form. In 1950 Grieves bowling duties dropped off significantly. In those first two years Roy Tattersall bowled gentle seamers, so Grieves shared the spinning role with orthodox slow left armer Malcolm Hilton, a fine bowler albeit one who never quite lived up to the expectation generated by his, as an 18 year old, dismissing Bradman twice in the ‘Invincibles’ visit to Old Trafford in 1948. In 1950 ‘Tatt’ switched to the quickish off breaks with which he made his name and secured him 16 Test caps. It was a spectacular start for Tattersall, who took 193 wickets at less than 14 in 1950. Had it not been for the presence of Jim Laker he would have played many more times for England. So from then on Grieves was needed in the leg trap or slips, where he would catch flies for the rest of his career, including a Lancashire record of 63 in 1950. Thus in the early 1950s Grieves’ leg spin became an occasional variation, and then in the mid 1950s two young leg spinners broke into the Lancashire side, both good enough to win Test caps, Tom Greenhough as a specialist bowler, and Bob Barber as an all-rounder, so Grieves bowling fell into disuse only being revived at all right at the end of his career. 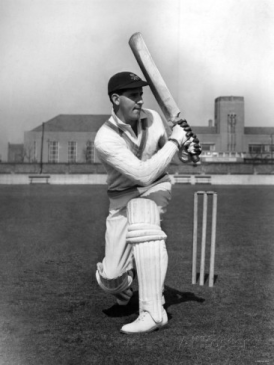 With the bat Grieves was one of Lancashire’s most consistent runscorers through the 1950s. Twice, in 1954 and 1958 he failed to get his 1,000 runs and averaged not much more than 20. In mitigation those were difficult years for batsmen. In 1954 there were 31 bowlers in England who paid less than 20 runs each for their wickets, and as many as 43 in 1958. Just a year after that however England basked in sunshine, and a year after his worst ever summer Grieves had his best, averaging 41.72 and scoring 2,253 runs, the only time he beat two thousand. That season only 14 bowlers could get under 20. As far as Grieves’ winter endeavours were concerned he spent three seasons at Bury playing 63 first team games in all. He then left the Football League and played briefly for Wigan Athletic, then in the Lancashire Combination and a long way from the lofty status the club has enjoyed in recent years. He didn’t stay with the Latics for long however, and his next move was to Bolton Wanderers, then one of the major clubs in the Football League. He was understudy to the long serving Stan Hanson but his 49 appearances in four seasons meant he had plenty of time in the cauldron of the old First Division. Had he played rather than Hanson it is tempting to wonder if the result of the famous FA Cup final against Blackpool in Coronation year in 1953 that the Trotters lost 4-3 might have been different. The final League club that Grieves played for was Stockport County, for whom he turned out 39 times in the old Division Three North. He went on to play as a semi-pro for one season with Nuneaton Borough in the Southern League in 1958/59. The following season he was late joining the team due to his cricketing committments and, his place lost as a result, a few reserve games saw his paid football come to an end at 34, then as indeed now no great age for a goalkeeper. Two years later, at the end of the 1961 cricket season, it looked like Grieves’ county career was over as well as he left Lancashire to return to league cricket. He had not been entirely happy when passed over for the captaincy in 1960 when the young amateur Bob Barber was appointed. Following that when Barber was relieved of the captaincy and Lancashire chose to pluck Joe Blackledge from the Northern League Grieves felt snubbed. The county’s desire to follow convention was typical of a large and unwieldy cricket committee, most of whom knew little about the game. But they had previously appointed Cyril Washbrook as captain for six seasons, so had broken with tradition before, and Grieves wasn’t prepared to play under Blackledge. It was back to the leagues in 1962, and Grieves took up the position of pro at Stockport, then in the Central Lancashire League. The Cheshire side were delighted with their decision as Grieves showed the county what they were missing. He scored 888 runs at 47 and took 47 wickets at 15 as the club shared the title. Meanwhile a little further north at Old Trafford Lancashire won just two of their 32 Championship fixtures and finished 16th out of 17. At least the committee were big enough to see the error of their ways. Blackledge went back to his textiles business and Grieves accepted an offer of the captaincy for the 1963 season. At first glance Grieves did little better than Blackledge, the county climbing just one place in the Championship. But Wisden commented that the captain obviously enjoyed his cricket. He played many aggressive innings and always showed the will to win. With a little more luck, he would have been more successful. Grieves’ own form was good. He scored 1,649 runs in a season over the course of which only one of his teammates managed his thousand. He also bowled 138 overs, tidily but without much penetration until the penultimate game of the season when, against Glamorgan at Swansea, he took 5-81 in a losing cause. It was the last of his eight career five-fers. At the end of Grieves’ second season in charge, 1964, his services were dispensed with once more and this did prove to be the end. His own form was fine as he scored 1,475 runs, but there was a climb of just one more place in the Championship and a good deal of internecine strife at the county that came to a head in a Gillette Cup tie against Warwickshire. Despite their modest seasons in the Championship with Grieves at the helm Lancashire did well in the first two summers of the new limited overs knockout, influenced no doubt by their skipper’s extensive experience of one day cricket in the leagues. Lancashire reached the semi-finals in both years. In 1963 they capitulated meekly at Worcester after being dismissed for a mere 59 on a green top made to measure for the home side’s seam attack. Better things were expected at Old Trafford against Warwickshire in 1964. Grieves won the toss and, as captains almost invariably did in those days, invited Warwickshire to bat. Unfortunately for Grieves and Lancashire however old boy Barber teed off with a very rapid 76 and the visitors’ innings closed at, by the standards of the time, an enormous 294. When Lancashire responded opener David Green set off in much the same manner as Barber, and at the tea interval Lancashire had made a good start and that was the cause of the trouble that followed. In those early days there were no fielding restrictions, so Warwickshire, apprehensive at the ease with which Green was scoring runs, set a field with at most three men saving one and the rest back on the fence. With a field like that and the niggardly Tom Cartwright at his parsimonious best Lancashire were struggling. When the visitors’ Pakistani opening batsman Khalid ‘Billy’ Ibadulla then struck a groove with his flat off breaks, firing his darts into the blockhole, any chance of Lancashire reaching their target evaporated. The whole side felt aggrieved at the tactics used against them and when the club Chairman went in to the dressing room to talk to the captain about why the reply had stalled the conversation was not at all constructive. The players attitude to their opponents and the state of the game was most vividly illustrated by the batting of wicketkeeper Geoff Clayton, who pointedly chose to play defensively for several overs. Lancashire ended up 86 short of victory with three wickets in hand. At the end of the season the club decided to sack Peter Marner, high on talent but short on patience for the Committee and some of the internal rules he was meant to adhere to. Also dismissed was ‘Chimpy’ Clayton. FA Cup Winner Jack Dyson was released and Grieves was not even offered a playing contract let alone the captaincy. He may have been in his fortieth year but his form and fitness were such that he was still capable of doing a job as he demonstrated in the Lancashire League and the Central Lancashire League where he was professional for Accrington, then Stockport and finally Milnrow over the next seven summers, getting more than his share of runs and wickets each year. With Grieves gone the Lancashire captaincy passed to Brian Statham, not really a leader, but a Red Rose legend. There was a very slow improvement through the mid 1960s but it was not until the baton passed to Jack Bond in 1968 that Lancashire were revitalised. In due course in 1978 Grieves joined a now much more enlightened and fit for purpose committee and rendered the county valuable service for the next twelve years. As a man Ken Grieves seems to have been liked and respected by his teammates. Barber’s view was that he had a well respected, good cricketing brain. As noted Grieves had been disappointed when Barber got the captaincy in front of him in 1960, and that seems to have strained their relationship, but Barber adds I remember him asking to see me at the end of play when I had gone to Warwickshire and he had finally got the captaincy. We went and dined and had a drink together. He wanted to tell me he was sorry for not understanding the problems that I had had to experience with the Committee. I liked him even if there were things which might have been different. After Grieves’ death at the age of 66 in 1992 former Lancashire all-rounder Alan Wharton wrote that he was a great practical joker with a wonderful sense of humour, but all his pranks were kindly and there was never a hint of malice or spite. He was fond of socialising as well, and seems to have had a bit of a reputation for enjoying his ‘refreshment’, but as Barber says even when he had enjoyed an evening out he had no problem putting his hand out to cup the nick in Brian Statham’s first over of the morning. Wharton did suggest that he felt captaincy was not Grieves’ ‘metier’ and that he preferred to be a ‘journeyman’. That seems not to have been an entirely accurate assessment, but even if Grieves did not covet the captaincy he certainly seems to have been a sympathetic leader and a good man manager. David Green relates a story from his 1964 season when he was struggling for form. Like Barber before him Green liked to put bat to ball and had a wretched run of form and then, without much more success, adopted a much more circumspect approach. Grieves took him to one side and pointed out to Green that there were plenty of other batsmen in the Lancashire side who bore the responsibility for scoring runs as well as him, and that he should stick to his natural game. His captain’s advice followed the ball soon started crossing the boundary for Green again.